This unique EGG is a high quality crafted keepsake. Two inset magnets keep the egg shut securely. Heart warming and unforgetable gift for any occassion ( Birthday, Engagement, Anniversary etc.) Place the jewels you bought for the special person inside this beautiful, eye catching jeweled keepsake and it will be remembered forever. Good collectible, perfect gift for any occasion or for your collection. It is an eye-catching piece on any cabinet, table, shelf or dresser. Black velvet lining. 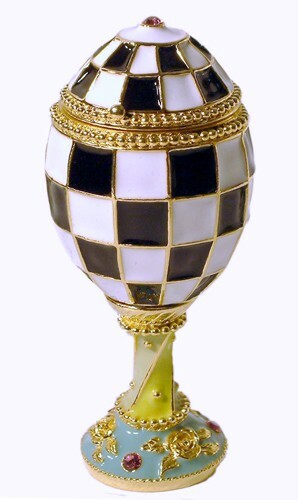 Bright 20K Gold and black/white checker enamel Finish with sparkling Colorful Swarovski Crystals. It measures 4" (with pedestal) height and 1-3/4" diameter. It is shipped in a Beautiful Gold Trimmed Gift Box. Faberge Style Genuine Goose Egg Music Box " Romance"